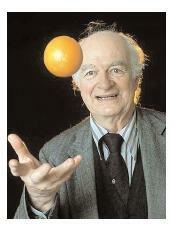 Two-time Nobel Prize winner Linus Pauling. Pauling's early work in chemistry earned him the world's respect, but his later work on nutrition was controversial. did not have much in the way of material wealth, especially after his father's death when he was only nine years old. However, Pauling was exceptionally bright and found many ingenious ways to make money, including delivering milk, running film projectors, and working at the local shipyard, to support his mother and two younger sisters. Pauling was a gifted student and earned a scholarship to Oregon State University where he earned his Bachelor of Science degree and later went on to earn a Ph.D. in chemistry at the California Institute of Technology. As a young scientist, Pauling first became known to the world of chemistry with his use of X-rays to examine the molecular structure of crystals. Pauling later began to focus his research on the way molecules bond and his insight led to the creation of many of the medicines, dyes, plastics, and synthetic fibers people continue to use today. His work was so influential that he was recognized in 1954 with the prestigious Nobel Prize for Chemistry. In fact, Pauling is the only person to ever win two unshared Nobel Prizes—he was awarded the Nobel Peace Prize in 1962. After being awarded his second Nobel Prize, Pauling began to study the role of nutrition in fighting disease. Pauling had spoken about the importance of vitamins and minerals to maintain health in the late 1930s, but he did not pursue research on the subject until almost thirty years later. Pauling proposed that large doses of vitamin C could protect a person from the common cold, and he wrote the book Vitamin C and the Common Cold in 1970. It quickly became a bestseller. He also believed in vitamin C's power to combat the flu, certain types of cancer , heart disease , infections, and even old age. In addition, Pauling suggested that other vitamins, such as vitamin E, and vitamin B also worked to fight disease and prolong life. In fact, Pauling believed that virtually all illnesses could be attributed to some form of vitamin deficiency. Although Pauling was recognized all over the world for his theory on the power of nutritional medicine, medical doctors and nutrition scientists often criticized his beliefs. Many scientists did not agree with Pauling's ideas about vitamin therapy and the impact of vitamins and minerals on a person's health. They even tried to disprove Pauling's ideas by conducting research studies to show that vitamin C did not prevent colds or cancer. However, many of these studies were flawed, and Pauling was always able to respond with his own research data and logical reasoning to support his beliefs. Pauling died of cancer at the age of 93 in August 19, 1994, at his ranch near Big Sur on the California coast. Before he died, he said that vitamin C had delayed the cancer's onset for twenty years. Pauling was awarded many prizes and received distinguished honors for his contributions to the fields of chemistry and humanity. He has been recognized as one of the most influential scientists of the twentieth century.